The car was loaded up Friday night, full tank of gas and I was ready to rock. The weather was supposed to be nice so it wasn’t going to be a case of layers on layers again I’m glad to say. The trip to Mustang Maniac was uneventful and I couldn’t settle on a mood of music for the radio. I arrived and was greeted by Adam walking through a new gate that he has just had put in to make it easier to get to the yard from the offices. It has only just happened this week after a couple of years of nagging to get it done. Anyway, I knew what my task was I was chomping at the bit to get going. The wires and dash need to be tidied up and the pretty bits fitted to the dash. Yes, I say pretty bits but what I meant was the essential bits. The wiper and light switches, ignition switch, cigarette lighter and heater controls. 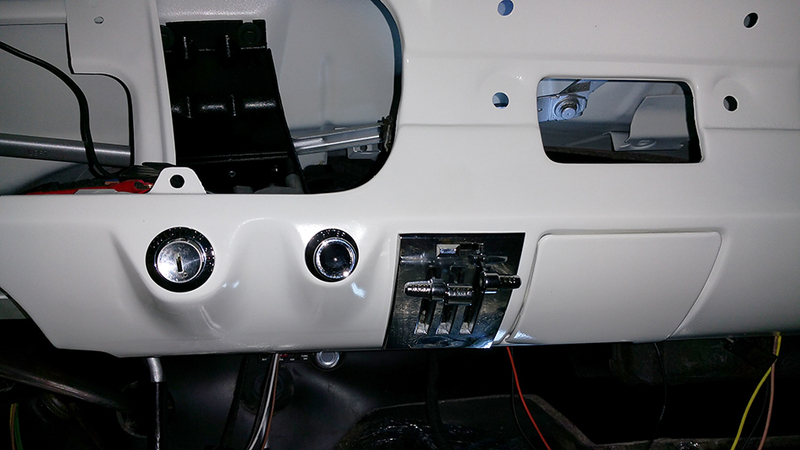 The first part was the lights as a big block that clamps on the back of the switch so it needed to be located and fixed in place before fixing it to the dash. Dead simple to fit as the dash ring locates into a groove and the light switch is held to the dash by a centre screw in part. Once that part is fitted the long bar with the knob on the end just pushes in and clicks into place. Next up was the windscreen switch, now this is an aftermarket switch and had to have an extra fitting screwed to it make sure the spacer cup was in the correct position and the knob didn’t stick out from the dash by about two inches. Again the dash ring is screwed into the middle to hold in place via the lugs at the bottom. While fitting the connections to the rear I remembered that there has to be an additional wire that runs to the washer pump from the switch. The Newport Wipers kit does not come with the wire nor did the AutoWire kit except for the washer connection due to the many configurations that there could be at the time of manufacture. To get round this I found a wire for a Variable Speed Sensor that would not be used for my car. 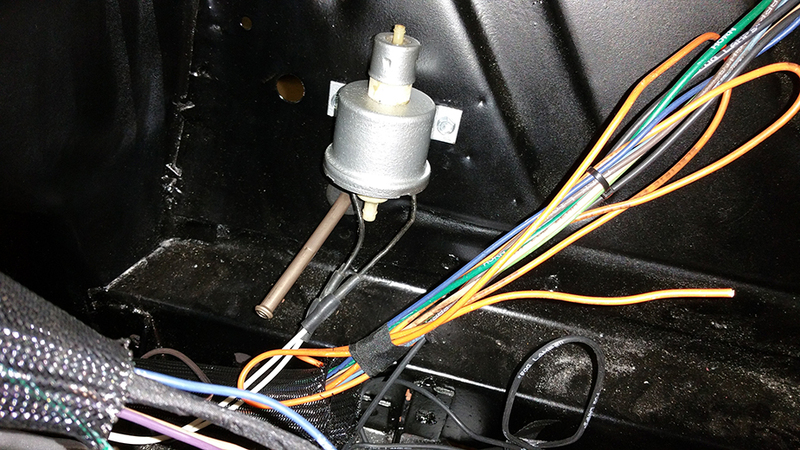 I reallocated that wire to the washer pump and followed it back to the inside of the car. The VSS wire runs to the dash gauges so I cut the wire and again rerouted it to the wiper switch. 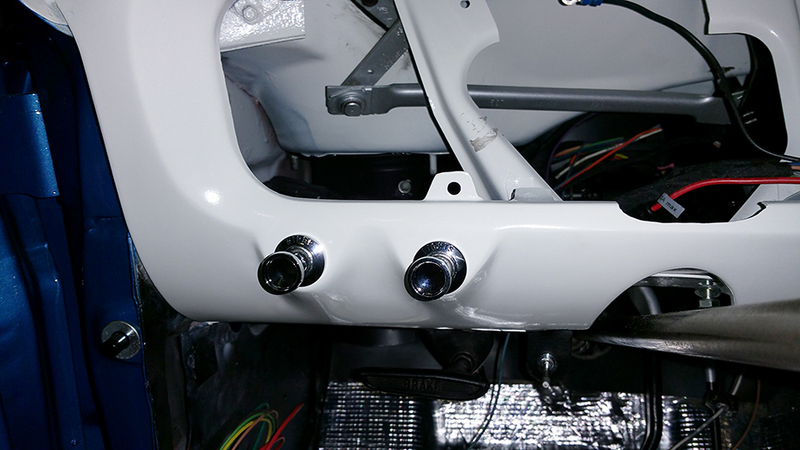 A female spade connector was fitted and pushed in place on the back of the wiper switch, job done. The wiper switch is a pain because unlike the lights that have a large cross in the middle, you have to tighten wiper switch centre tube up with a pin in the way. To get round this I made a tool that fits over the top with two legs that twist the locking centre tube into place thus holding it to the dash. The pics here are outside the car to make it easier to see. The tool was made from an old wiper blade not the cheap aluminium ones now days, but a real old solid one I had laying about. Anyway it worked although I bent it a bit still. The knob for this was a tiny 5/64ths Allen grub screw, having the correct key is important not to damage the fine flats inside the head. The next part was the heavy wires for the ignition switch. This is again held in place by a spacing cup behind the dash and a set of locating lugs for the dash ring. There is a special tool that holds this in place while you locate the back of the switch. But I found that by thumb wedged in the hole and then twist the back to the dash ring via the spring, it clips in nicely with a reassuring click. The plug from the wire loom pushed onto the back and the tiny nut to hold the accessory feed and the plug in place is tightened up. The final part was simple cigarette lighter. This is a twist into position effort with a female bullet connector for the thread at the back for the live feed. 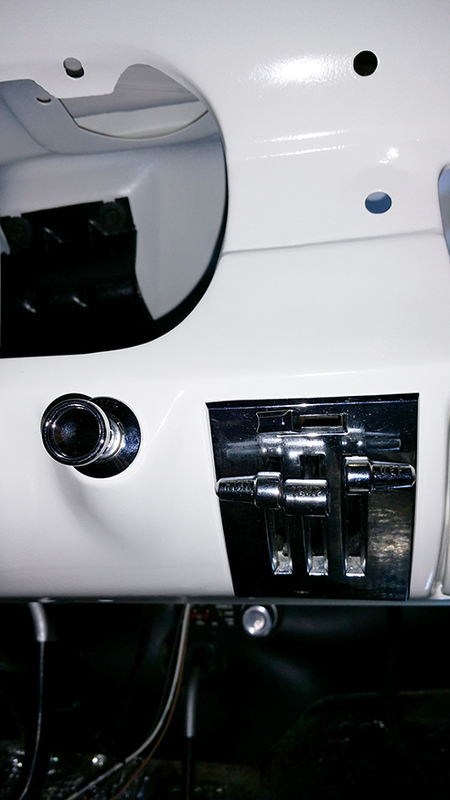 Now for the heater controls, this plate is located via two holes in the dash and two clamps at the back. The trick is to thread the control cables through the opening and direct them to the top of the heater box. Clamps at the top of the heater box hold the cables in place so that the levers can pull the wire freely in and out to operate the flaps on the box. This was a much quicker process that I thought it would be and was fitted in about fifteen minutes flat. The ash tray was is slightly broken and if you pull it to hard from the mount then the it will come straight out. But, as I don’t smoke I wont be using it, so it’s there just to fill a hole and still be part of the original car. 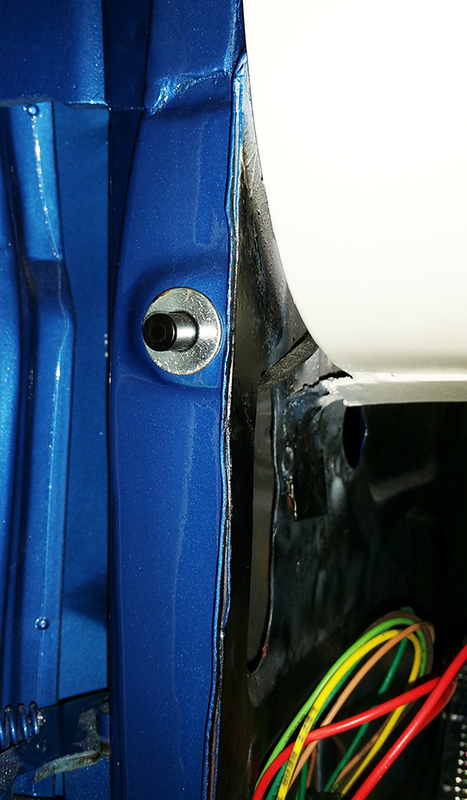 Two bolts on the side of the recess holds the bracket for the ash tray and two at the top hold it flat. Again another ten minute job. The ashtray slid in and looks a awesome colour matched to the dash. I will take it out and fix it at a later date when I have nothing better to do. While I was inside the car I took the courtesy light wires to the door jam switches and pressed them into the A pillars. A bit of a fiddle job making the wires disappear, but I will tidy that up a bit later once I know all is well. That’s the inside done for now at least anyway. I decided to fit the washer pump into place with just two self tap bolts, but not connect the wires up just yet. I must say it looks quite good against the satin black. While I was at it I thought I would screw a voltage regulator onto the inner front panel where they are supposed to be. Those that have been reading my blog from the beginning may remember that the American AutoWire kit requires a One Wire Alternator so the voltage regulator is not needed. As this is blown one that Adam had lying around he gave it to me. Just for show of course and the wire loom pig tail that goes with it will be a dummy set of wires into the main loom to give it that more stock look, all be it polished chrome. But shhhhh – don’t tell anybody as it’s a secret! 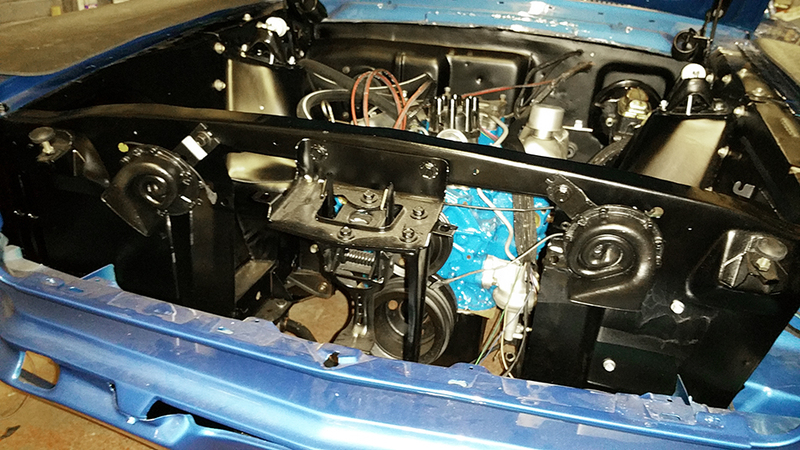 Time was drawing to a close so I fitted the two horns to the front of the car, just to free up some more space that don’t have to laying around in the way anymore. 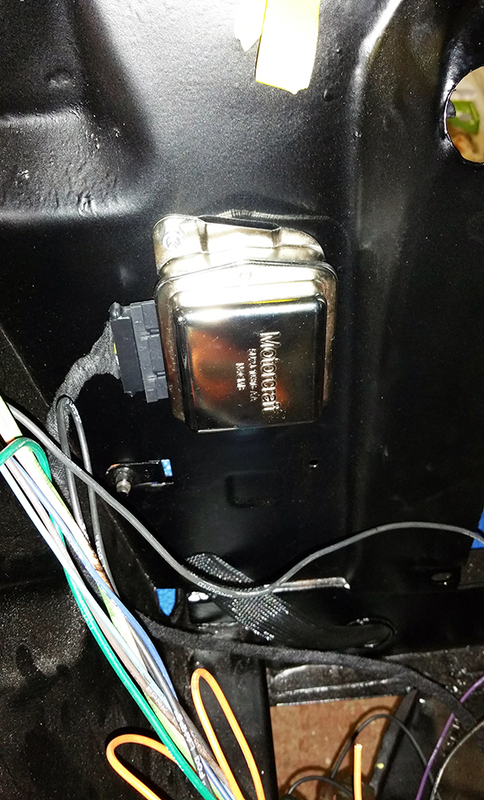 This entry was posted in General and tagged American Autowire, chrome, courtesy lights, dash, heater box, home made tool, horns, Mustang, Mustang Maniac, Newport Wipers, One man and his Mustang, one wire alternator, variable speed sensor, wiper motor, wire loom. Bookmark the permalink. Delightful post on the on-going progress. Love the shiny bits and how it’s all coming together. Keep at it. Good weather has finally blessed us in St. Louis. Soon you will be out and spinning about in your awesome Mustang! Thank you Debbie, I can’t stop now I just gotta finish this beautiful piece of American automotive art. That’s when they knew how to build a car. I have this yearning to drive it and it just keeps getting stronger and stronger. Things are looking so shiny!